There can be a myriad of problems that can be faced when contemplating making a proposal of marriage. OK, the main one is – will she/he accept the proposal anyway? That’s the first hurdle, and once that can be put aside there’s a chance of moving forward. Another consideration is the ring and whether to choose one in advance or whether to buy a temporary ring until one can be chosen together. For someone contemplating a romantic proposal there are many options that may be suitable and obviously depending on the person being proposed to – booking a luxury weekend at a hotel offering spa treatments may be the ideal choice. Champagne then dinner with a good bottle of wine and then a wander round the hotel grounds to a pre-determined spot to propose, having already arranged with the hotel staff for them to have another bottle of champagne on ice in readiness for the acceptance. Another alternative suggestion could be a treasure hunt, which may need a little time in arranging, but could be a really fun thing to do. Provide a clue that leads to a small gift and another clue with yet another gift and eventually end up when the answer to the last clue is a ring or perhaps a ring box. For the couple that want to go up in the world there is the option of booking a trip in a hot air balloon. There are many different companies all experienced in making sure that their passengers really enjoy their time in the air. 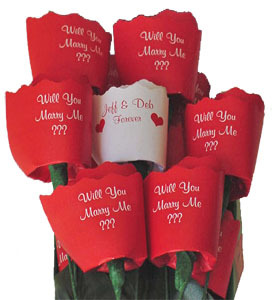 There are so many different options for making a wedding proposal. The most important thing is timing. Don’t rush into a proposal – make sure that it is something that you both want, after all the proposal and engagement is just the beginning of the rest of your lives together.